January has seen a number of surveying events take place, as firms aim to get perspective on the year ahead. One clear message we’ve seen repeated is the positive attitude to change and the embracing of digital technology in the mortgage market. 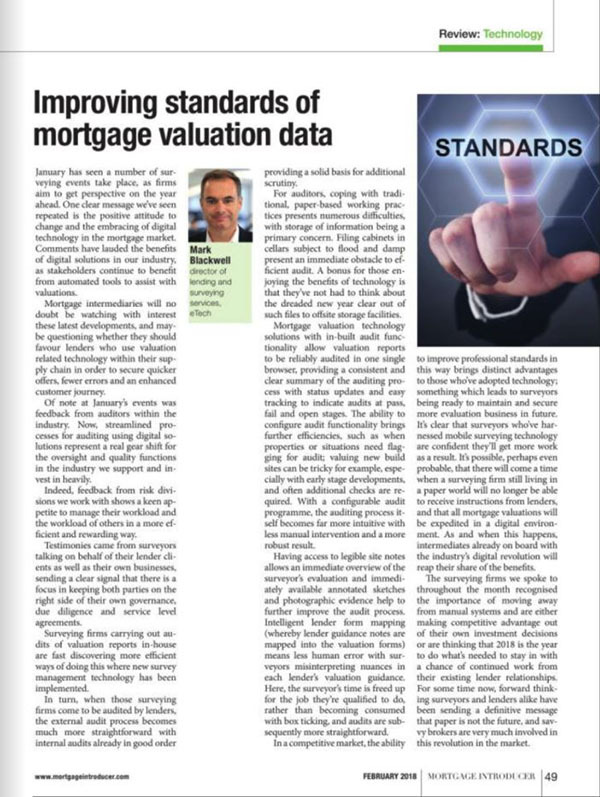 Comments have lauded the benefits of digital solutions in our industry, as stakeholders continue to benefit from automated tools to assist with valuations. Mortgage intermediaries will no doubt be watching with interest these latest developments, and maybe questioning whether they should favour lenders who use valuation related technology within their supply chain in order to secure quicker offers, fewer errors and an enhanced customer journey. Of note at January’s events was feedback from auditors within the industry. Now, streamlined processes for auditing using digital solutions represent a real gear shift for the oversight and quality functions in the industry we support and invest in heavily. Indeed, feedback from risk divisions we work with shows a keen appetite to manage their workload and the workload of others in a more efficient and rewarding way. Testimonies came from surveyors talking on behalf of their lender clients as well as their own businesses, sending a clear signal that there is a focus in keeping both parties on the right side of their own governance, due diligence and service level agreements. Surveying firms carrying out audits of valuation reports in-house are fast discovering more efficient ways of doing this where new survey management technology has been implemented. In turn, when those surveying firms come to be audited by lenders, the external audit process becomes much more straightforward with internal audits already in good order providing a solid basis for additional scrutiny. For auditors, coping with traditional, paper-based working practices presents numerous difficulties, with storage of information being a primary concern. Filing cabinets in cellars subject to flood and damp present an immediate obstacle to efficient audit. A bonus for those enjoying the benefits of technology is that they’ve not had to think about the dreaded new year clear out of such files to offsite storage facilities. Mortgage valuation technology solutions with in-built audit functionality allow valuation reports to be reliably audited in one single browser, providing a consistent and clear summary of the auditing process with status updates and easy tracking to indicate audits at pass, fail and open stages. The ability to configure audit functionality brings further efficiencies, such as when properties or situations need flagging for audit; valuing new-build sites can be tricky for example, especially with early stage developments, and often additional checks are required. With a configurable audit programme, the auditing process itself becomes far more intuitive with less manual intervention and a more robust result. Having access to legible site notes allows an immediate overview of the surveyor’s evaluation and immediately available annotated sketches and photographic evidence help to further improve the audit process. Intelligent lender form mapping (whereby lender guidance notes are mapped into the valuation forms) means less human error with surveyors misinterpreting nuances in each lender’s valuation guidance. Here, the surveyor’s time is freed up for the job they’re qualified to do, rather than becoming consumed with box ticking, and audits are subsequently more straightforward. In a competitive market, the ability to improve professional standards in this way brings distinct advantages to those who’ve adopted technology; something which leads to surveyors being ready to maintain and secure more evaluation business in future. It’s clear that surveyors who’ve harnessed mobile surveying technology are confident they’ll get more work as a result. It’s possible, perhaps even probable, that there will come a time when a surveying firm still living in a paper world will no longer be able to receive instructions from lenders, and that all mortgage valuations will be expedited in a digital environment. As and when this happens, intermediates already on board with the industry’s digital revolution will reap their share of the benefits. The surveying firms we spoke to throughout the month recognised the importance of moving away from manual systems and are either making competitive advantage out of their own investment decisions or are thinking that 2018 is the year to do what’s needed to stay in with a chance of continued work from their existing lender relationships. For some time now, forward thinking surveyors and lenders alike have been sending a definitive message that paper is not the future, and savvy brokers are very much involved in this revolution in the market.